Be part of a living, building, community! Live & Learn Natural Building & Sustainable Living Skills in a beautiful rural wooded setting 1 hour north of Detroit, Michigan, U.S.A. This 30-day program is built around four weekend workshops which are also open to the public. Students will help prepare and participate in these workshops on Thatching, Round Pole, Rocket Stove & Earth Plaster. The Winternship Program will also include classes in natural building design, and a wide variety of sustainable skills. 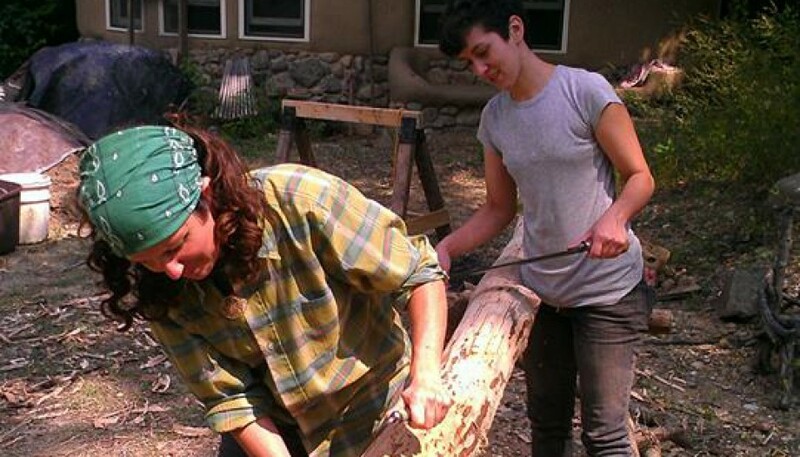 SUSTAINABLE SKILLS such as fermenting kombucha, sourdough, composting, whittling, earth oven / haybox cooking and more. Teamwork makes the dream work. Petar is using a draw knife on a new post. Jacob and Veneta using draw knifes to de-bark the recently felled tree. Off to the back 40 acres to find some trees to harvest. Round Pole class with Mark Angelini. 2017 Winternship Program will be similar to previous years. Click links below ! Deanne Bednar will be the primary teacher. Background: Natural Building since 1996. Studied and teaches with the Cob Cottage Company . Illustrated 3 books on natural building : The Hand-Sculpted House, The Cobbers Companion, The Natural Plaster Book. Previous life – art teacher, sustainable futures teacher at middle school level. Masters in Social Ecology. Loves earth, thatching, foraging, music & permaculture ! Guest Teachers include Micah Lindquist, teaching round pole & carpentry, Chris McClellan, code presentation. Internships: $950/ month or just $850/month if prepaid 1 month in advance. 1/2 Pay Worktrade is also available. $475 or $425 paid 1 month in advance. Contribute 10 hours of help toward infrastructure, such as office, grounds, repair. Both options include room, food, materials & training. All participants take part in cooking & household. There is no WWoofing during the Winternship, because it is such an intensive learning experience. Call or text Deanne 248 497 4088 or email ecoartdb@gmail.com to indicate interest or ask questions.